Parliamentary Secretary Planning Chow Zingnu Namchoom who is also the local legislator of Namsai called on Minister of Health Jomde Kena in his office chamber today. He was accompanied by ZPC Namsai Chow Kyasing Mounglang, Anchal Chairperson C.O.Maio and Women Welfare Society Namsai General Secretary Nang Pinjira Namchoom. Namchoom appraised the Health Minister of the prevalent situation related to drugs menace amongst the youths of Nsmai district and the need to immediately make the de-funct De-Addiction Centre functional to help rehabilitate the affected youths. He informed that Namsai district which is badly affected from drug menace and the worst affected are the youths. To help the addicts particularly the youths in the recovery process a rehabilitation centre is a must. The rehabilitation centre can hold various de-addiction drives and can provide opportunity for addicts to enter into a comfortable atmosphere where they can meet and relate to other addicts, Namchoom added. He said that due to non-posting and absence of doctors and other para medical staffs at the De-Addiction Centre at Lathao under Namsai District, the centre could not be made functional till date. The foundation stone for the De-Addiction Centre was laid on 27thFebruary 2008 which was completed during March 2011. He requested the minister to prioritize the matter and to post doctors, para medical staffs, other supporting staffs and provide necessary equipment, medicines, furniture to make the De-Addiction centre at Lathao functional at earliest. 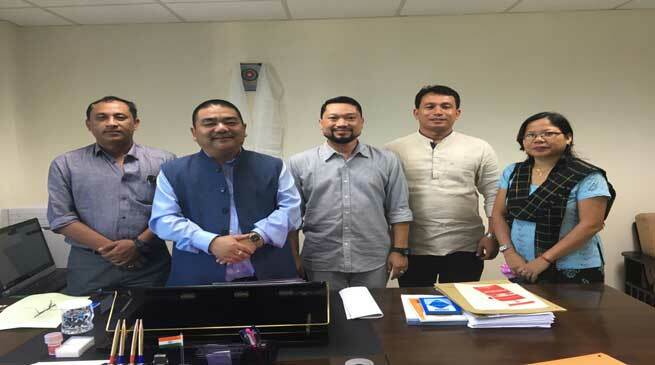 He also put emphasis for declaring the Namsai CHC to District Hospital subsequent upon creation of Namsai as new District to benefit the people of his district. The Health Minister has assured to look into the matter as early as possible.